Ask RP Photonics for advice on any aspect of laser gain media or laser modeling. When a gain medium amplifies a strong laser beam, the gain is saturated, i.e. reduced to some extent. Under certain circumstances, the saturation can be inhomogeneous, i.e. it can be stronger around the wavelength of the laser beam than at other wavelengths. Figure 1: A demonstration of inhomogeneous gain saturation. A laser at 1064 nm saturates the gain around 1064 nm more than the gain at other wavelengths. For comparison, the unsaturated gain (without laser power) is shown as a dotted curve. Inhomogeneous saturation characteristics are strongly related to inhomogeneous broadening and can arise when different laser ions in the gain medium can occupy different lattice sites (assuming a solid-state medium). This is particularly the case in glasses. However, some glasses exhibit nearly homogeneous gain saturation despite the great variety of lattice sites. This is the case for, e.g., neodymium-doped phosphate glasses, whereas silicate glasses show strongly inhomogeneous saturation. Spatial hole burning in linear laser resonators can also lead to inhomogeneous saturation. In that case, laser ions at different locations in the gain medium “see” different wavelengths with different intensities, because the period of the standing-wave pattern depends on the wavelength. 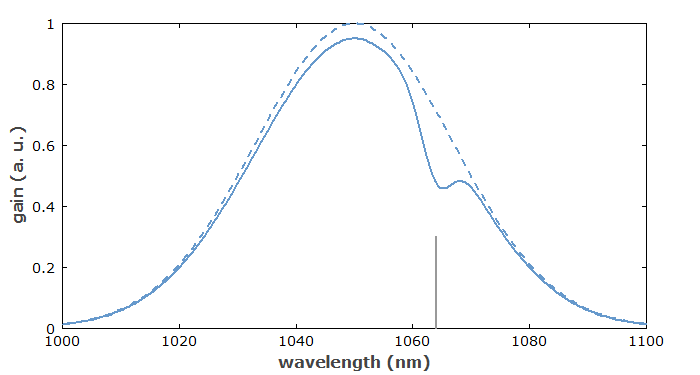 In a laser, inhomogeneous saturation characteristics can influence the optical spectrum of the laser output and restrict the wavelength tuning range. For a mode-locked laser, this effect can make it easier to obtain short pulses, but can also adversely affect the self-starting characteristics.